Jeffrey Hargrave - Founder & President of Mahogany, Inc.
Jeff Hargrave is the founder and President of Mahogany, Inc., a commercial construction company which specializes in General Contracting services and Architectural Millwork. He is a native son of Baltimore City who graduated from Mergenthaler Vocational Technical High School. Later, he attended Catonsville Community College as well as Phoenix University where he studied business management. He celebrates over 23 years of successful business. Recognized by Baltimore’s Smart CEO Circle of Excellence as one of the city’s top 10 CEOs, Jeff has grown Mahogany to its current size of 100 employees, with sales grossing 16 million a year. 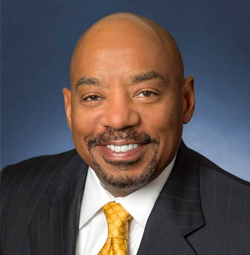 He is currently Chapter Chair for the Associated Builders & Contractor’s Baltimore Chapter (ABC), Associated General Contractors (AGC), and an active member the Maryland Minority Contractors Association (MMCA) and a graduate of GBC leadership class of 2009. He is greatly involved with many civic community based programs by serving on the boards of My Sister’s Circle, Living Classrooms, and the Baltimore Design School. He also is also a member of the University of Maryland Medical Systems (UMMS) Board of Visitors. Mahogany has repeatedly been listed by the Baltimore Business Journal Book of Lists as one the largest minority contractors in Maryland. Jeff is married to his wife Beneak and they worship at the City of Zion-New Psalmist Baptist Church. Jeff enjoys spending his time away from the office golfing.